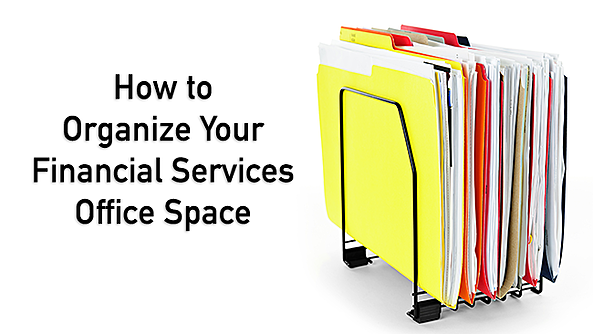 Besides the obvious things like desks, chairs, internet, shelving and cabinets and a television, you’ll want to organize your financial services office space to optimize efficiencies. Most of your processes should be handled by your assistant or office manager and you’ll want to give them the tools to create the most efficient process possible. Focus on the details and plan your workflow carefully. It may cost you up front but your time is valuable and hours saved can be spent meeting with clients. Your assistant will obviously need a spacious desk with a computer and printer, filing drawers and shelves. They will need a label maker, manila folders, a variety of colored folders (choose your color path), some sort of vertical filing system that is attractive enough for the open space in the front room, and the standard office supplies. Set up the workflow so that it’s easy for your assistant to complete the work and set it up in a place that’s easily accessible to you as you breeze by. When you come into the office, you should be able to see at a glance what your day is going to look like. You should NEVER have to search for your appointment schedule OR your client files. Your client files should be labeled clearly and color coded by status. It might seem silly, but color coding will save you time. Being able to look at your files and KNOW what each color means, clears your thinking and speeds up your process. You won’t have to think about what you will be doing next. It’s already determined for you. You walk in the office and know how your day is lined up. Folders are color coded so you will know what each meeting will be about. You don’t have to know right away who the client is but you already have your plan of action in mind just from the color of the file. A green folder means that the client is new to the agency and this meeting is your discovery meeting. A yellow folder means that you have completed the discovery stage and now you are conducting the analysis meeting with this client. A red file means that you are in the Implementation Phase. This file will be in use for a while. Inside this folder, along with your client documents, should be an action item list that you can check off as you go. That way, you and your client…as well as your assistant, will know what needs to happen next. A blue file means that your client files are complete and in the review stage. This is the file that will go into the drawer for regular maintenance reviews. When your client goes into review phase, your assistant will set a reminder to contact your client every 6 months to check in. That was a simplified example and you may find that you want to add more colors to your path to designate status but you get the idea. There are a lot of things your assistant will do to simplify and organize your work life. Let them do it and give them all the tools they need. You will breathe easier, demonstrate higher levels of efficiency and be a better agent. You should focus on the tasks only you can accomplish and let your assistant manage your workflow and office organization.